Your funds converted to euros. Your money transferred safely to Italy. In the excitement of buying a dream home in Italy, don’t forget vital matters such as how to get your funds converted to euros and your money safely to Italy. the specialist in buying overseas property. We chose Smart because it typically offers better rates and service than your high street bank and is the UK’s most trusted provider for “Money Transfers” and “Currency Exchange” as ranked by TrustPilot – since 2016. 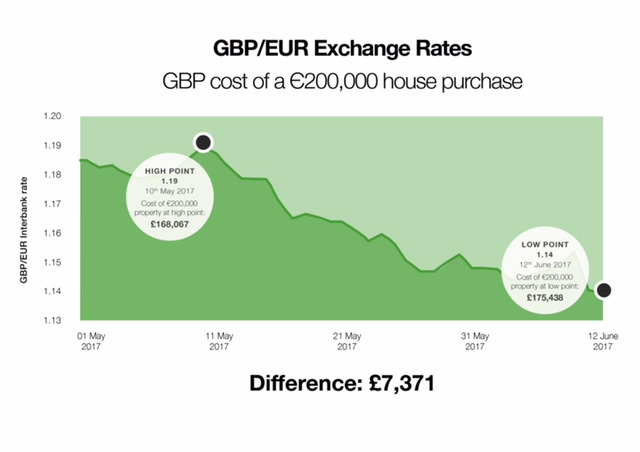 When you’re spending lots of money on an Italian property, you want the best exchange rate possible. Ideally you want as close to the “interbank” rate (which you can see on our online converter) as possible, and from a reliable financial institution. So, your bank? Well, they do score highly for reliability, but banks don’t usually offer the best rates or service for home buyers compared to a currency specialist. Smart offers ways to transfer money that match your needs. For example, if you’re paying a 10% deposit and the balance on completion, Smart can set your rate now to last up to a year. That means no nasty surprises if the exchange rate changes before completion, as it is tends to (see graph). It’s all about what works for you, after chatting through your options with a specialist from Smart. Most of all, you don’t want to take any risks with so much money. Smart is authorised by the UK regulator, the Financial Conduct Authority for the provision of international payments. It has a dedicated Italy team and has helped over 40,000 people transfer £4billion over the past ten years. to set your property buying budget and see how much you can save.